Does anyone else still make Christmas gift tags from their Christmas cards? We always helped my Mum with this when we were children. January seems the wrong time to be thinking about next Christmas already but as yesterday we had to take the Christmas decorations down, it was also the day to make my gift tags. As you can see from the already cut ones I used scissors with a wavy edge. My Mum always made them using pinking shears, which looked better to me, but despite them being on my Christmas list this year I don't actually own any so the cheap wavy scissors came in handy. I did get some very nice Christmas presents though so I can't complain. 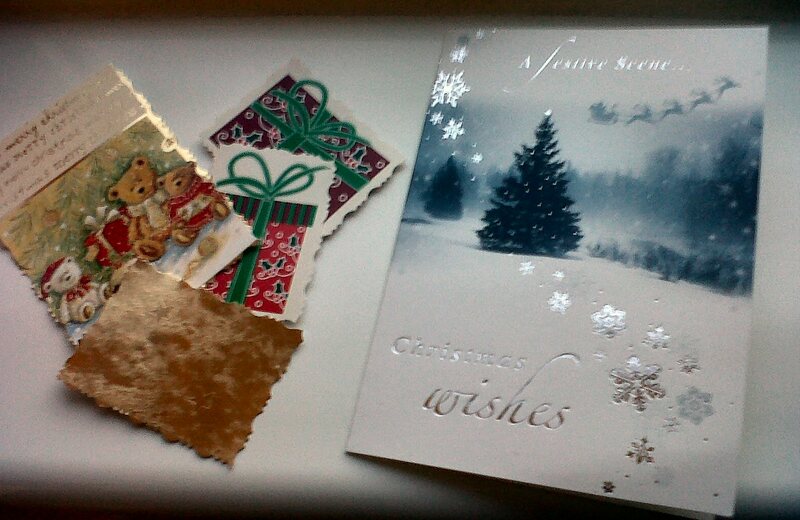 If you've never done this before simply collect together your Christmas cards and sort out the suitable ones. Charity ones often have writing on the inside of the front so they aren't suitable and sometimes the really posh ones have a picture on the inside as well as the outside so they aren't suitable. You don't want the gift tags to be too big or too small so depending on the picture on the front you might not always be able to get a gift tag out of each card. Some cards though you can get a few out of. On the full card above I ended up getting one gift tag out of the two fir trees, and another one out of the Christmas wishes. Sometimes there doesn't even need to be an appropriate picture, you may be able to see the plain gold on in the picture above. That came from underneath the teddies on the tag below it and makes a perfectly decent gift tag by itself. To use just punch a hole in the corner using a hole punch and pop some cotton thread or cord through it to attach to the parcel. I got twenty gift tags to use for next year, not bad for free. Do you have any Christmas traditions like this?